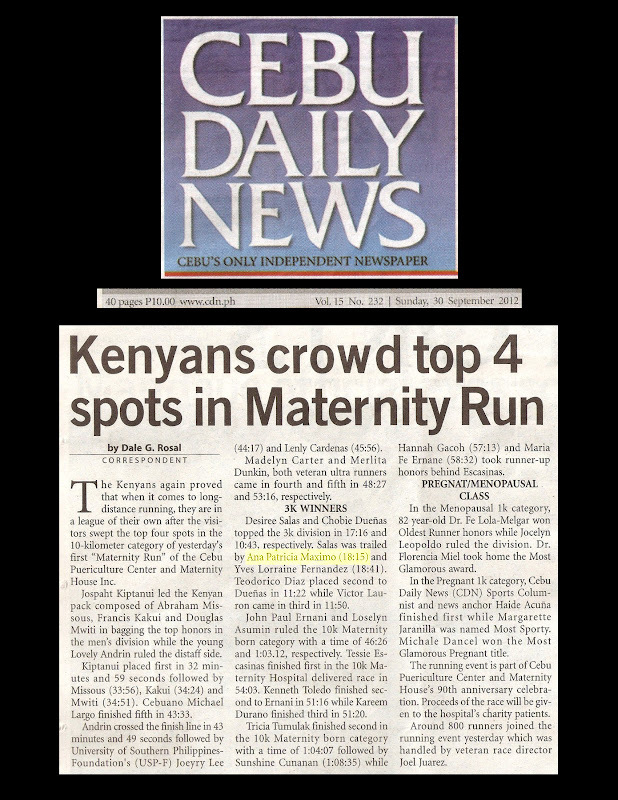 The Kenyans again proved that when it comes to long distance running, they are in a league of their own after the visitors swept the top four spots in the 10-kilometer category of yesterday's first "Maternity Run" of the Cebu Puericulture Center and Maternity House, Inc.
Jospaht Kiptanui led the Kenyan pack composed of Abraham Missous, Francis Kakui and Douglas Mwiti in bagging the top honors in the men's division while the young Lovely Andrin ruled the distaff side. Kiptanui placed first in 32 minutes and 59 seconds followed by Missous (33:56), Kakui (34:24) and Mwiti (34:51). Cebuano Michael Largo finished fifth in 43:33. Madelyn Carter and Merlita Dunkin, both veteran ultra runners came in fourth and fifth in 48:27 and 53:16 respectively. Desiree Salas and Chobie Duenas topped the 3k division in 17.16 and 10:43, respectively. Salas was trailed by Ana Patricia Maximo (18:15) and Yves Lorraine Fernandez (18:41). Teodorico Diaz placed second to Duenas in 11:22 while Victor Lauron came in third in 11:50. John Paul Ernani and Loselyn Asumin ruled the 10k Maternity born category with a time of 46:26 and 1:03.12, respectively. Tessie Escasinas finished first in the 10k Maternity Hospital delivered race in 54:03. Kenneth Toledo finished second to Ernani in 51:16 while Kareem Durano finished third in 51:20. Tricia Tumulak finished second in the 10k Maternity born category with a time of 1:04:07 followed by Sunshine Cunanan (1:08:35) while Hannah Gacob (57:13) and Maria Fe Ernane (58:32) took runner-up honors behind Escasinas. In the Menopausal 1k category, 82 year-old Dr. Fe Lola-Melgar won Oldest Runner honors while Jocelyn Leopoldo ruled the division. Dr. Florencia Miel took home the Most Glamorous award. In the Pregnant 1k category, Cebu Daily News (CDN) Sports Columnist and news anchor Haide Acuna finished first while Margarette Jaranilla was named Most Sporty. Michale Dancel won the Most Glamorous Pregnant title. The running event is part of Cebu Puericulture Center and Maternity House's 90th anniversary celebration. Proceeds of the race will be given to the hospital's charity patients. Around 800 runners joined the running event yesterday which was handled by veteran race director Joel Juarez.